Thought I’d pass along some information about 35 $1000 grants that are available from the National Center for Safe Routes to School. The application deadline is April 7, 2010. I spent two fantastic days in Marin, CA this week visiting with old friends and hanging out with their families. Just north of San Francisco, Marin is the epitome of car culture with traffic jams, packed parking lots and streets clogged with luxury cars. 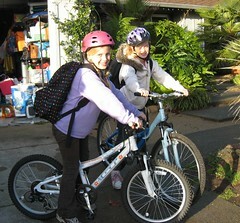 Bike to School Month is in full swing. The racks have been full this past week despite the rainy weather. 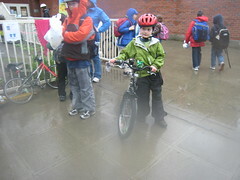 This hardy group of riders doesn’t mind biking in the rain. Way to go. 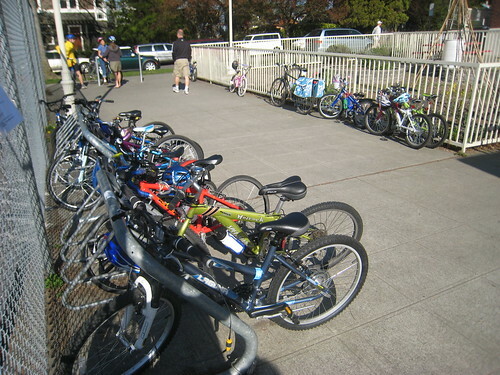 The increased number of pedalers around the school means a few biker, non-biker conflicts. We’re learning from each other and need to keep an open dialog so we can live harmoniously on the shared streets and sidewalks. Walk and Wheel Month is off to a great start. 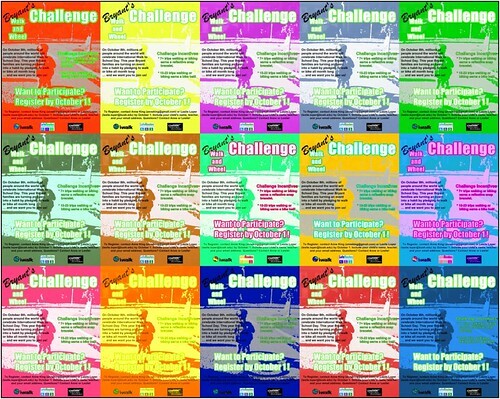 108 kids from our local school have officially signed up. That’s a lot of walking and biking. Even if every kid doesn’t walk or bike every day, at least we’re getting some cars off the road on a regular basis. 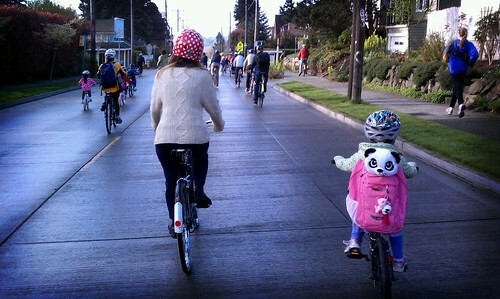 Last week we walked to school with some neighbors who normally drive the five-uphill-blocks. 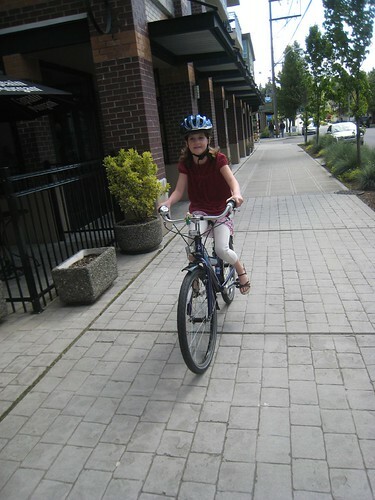 The mom admitted that shame kept her from driving that day—she didn’t want us to see her driving to school. 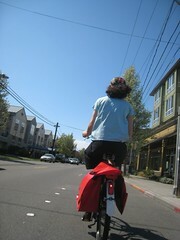 I say, whatever motivates you to get out of your car, roll with it!